At this point it’s safe to say that Ted Naifeh is pretty much a comics auteur of sorts. His work is as distinctive as it is engrossing, and from the gothic romance of Gloomcookie through to his swashbuckling, high-seas adventure Polly And The Pirates, he’s shown time and again that he’s able to nimbly shift genres with a minimum of fuss. Having firmly established himself with the YA crowd, here he is aiming at a more mature readership and in this new series from Oni Press he tackles the most ubiquitous of comic genres; the superhero. There is a prevailing theory that superheroes are modern myths, and here the “mythic” element take centre-stage as a ragtag bunch of thieves, bards and ne’er-do-well’s come together on a dangerous quest for treasure and glory. This first issue is very much setting the stage, as our nominal hero The Night -a master thief moonlighting as a barmaid – joins forces with a group determined to infiltrate and pillage The Tower Of Uhlume, a place filled with as much danger as it is gold. So far so predictable, right? Well, you’d be wrong to assume that, as he takes those fantasy archetypes and projects them through the prism of modern superheroes, putting a unique spin on tired tropes. Whilst at first glance this seems firmly nestled in the fantasy genre, it has the feel of classic superhero team books like The X-Men, with its bickering band of misunderstood outcasts thrown together in a harsh, brutal world of dimly-lit taverns, cobbled alleyways and imposing spires. That’s not to say that it’s completely po-faced though, as Naifeh’s ear for warm, funny dialogue and smooth skill for visual storytelling gives the characters and story a snappy bounce amidst the darker elements, making it an absorbing read full of energy, laughs and action. This is tailor-made for those searching for something a little bit different from what the Big Two have to offer at the moment. 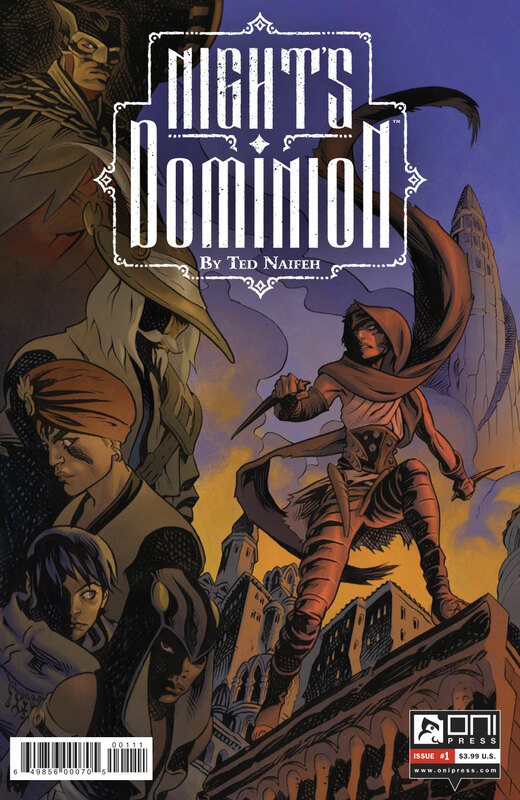 If you want to find out more about NIGHT’S DOMINION, make sure to check out our interview with series creator Ted Naifeh by CLICKING HERE.